BEST known as the front man of Hunter rock group DV8, guitarist GREG BRYCE has swapped his Fender Telecaster for an acoustic guitar in his Celtic rock group JIGZAG. Performing Thursday night at Hamilton's Northern Star Hotel the Sydney-based Jigzag has been announced as an inclusion in the WOODFORD FOLK FESTIVAL north of Brisbane on December 27. The band will release its debut album THE OFFERING in time for the festival which features top overseas artists and some of the best folk, pop and world music in Australia. 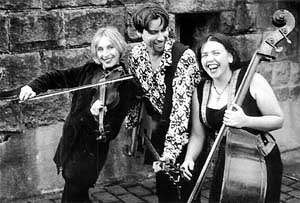 Jigzag is an Irish trio with a difference, featuring Bryce on acoustic guitar, his partner CAROLINE TRENGROVE on fiddle and LIZ FRENCHAM on double bass and vocals. Bryce and Frencham wrote four songs each on the album, with another four instrumentals displaying influences as diverse surf guitar, jazz, folk and pop music. 'It's a great little acoustic band, it's full of energy and it's just good fun; it's good value,' Bryce said. Playing four nights a week in Sydney, Jigzag has capitalised on a surge of interest there in Celtic music. But Bryce has been interested in the music for more than a decade. He said he liked the idea of taking 'traditional' music and blending it with 'funky, sort of contemporary backbeats' and 'interesting, high energy rhythms'.